Being involved in a motorcycle accident can be frightening. You may suddenly find your entire life turned upside down in the blink of an eye. Even while you are struggling to recover, insurance companies and creditors may begin applying pressure to you and your family. During this time, many accident victims are tempted to take the initial settlement offer, so they can pay their expenses and support their family. 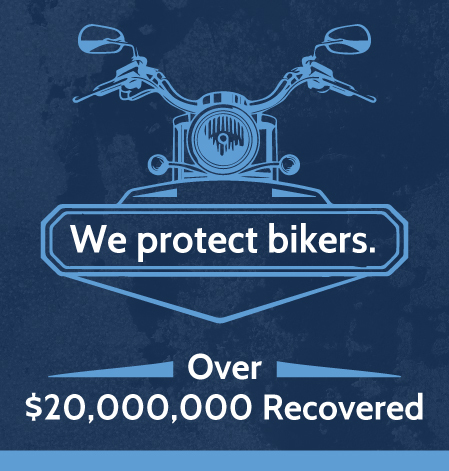 Often this settlement is far below what you need to recover and put your life back together again after a tragic motorcycle accident. Never sign anything without first speaking to an experienced Arkansas injury lawyer. At Rainwater, Holt and Sexton, our motorcycle accident attorneys offer compassionate and aggressive legal representation from the start. We understand the complications that can arise after a motorcycle accident, and we know that insurance companies will stop at nothing to reduce their own liabilities. We also know that motorcyclists face an uphill battle when trying to collect the compensation they deserve and without an attorney on their side, they may fail to secure the money they need to recover. Did you know that in multiple vehicle accidents, ⅔ of all motorcycle accidents are caused by the other driver most often violating the motorcyclist’s right of way? The motorcyclist almost always suffers the majority of the injuries, many of which are life-threatening. According to the National Highway Traffic Safety Administration, motorcyclists are 28x more likely to sustain serious injuries in an accident. When you are left with crippling injuries and mounting medical expenses, the driver who was at fault for the accident should be held liable for the damages they have caused. An attorney can help you hold negligent drivers accountable for their actions, while protecting your legal rights to compensation. For decades, the experienced and skilled legal team at Rainwater, Holt & Sexton have successfully advocated for motorcycle accident victims throughout Arkansas. Our lawyers have won multi-million-dollar jury verdicts and settlements for our injured clients across the state. 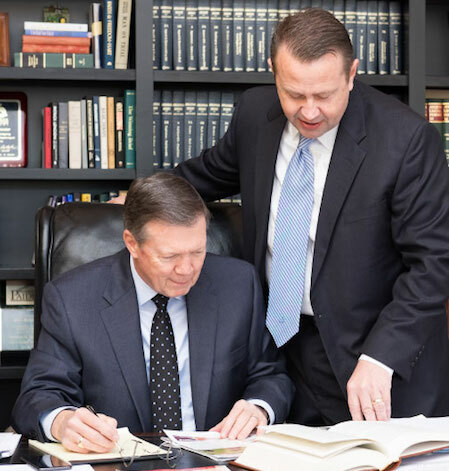 With four offices, 25+ attorneys, and more than 100+ legal staff, we are ready and willing to fight for you after a serious motorcycle accident. Here, you are never just a number—you are our number one priority. Call 911 – After an accident, motorcycle accident victim’s number one priority should be seeking medical attention. This is best done by calling 911 or directing someone at the scene of the accident to call for you. Calling 911 will alert emergency response teams to your location and it will also ensure that the police arrive on the scene to prevent further injuries from occurring. Assist with Police Report – When the police arrive at the scene of your accident, remain calm and work with them while they fill out their accident report. Answer any questions they may have but avoid saying anything that could imply fault. An accident report is an invaluable piece of evidence that can be used to establish liability after a crash. Snap Pictures – If you are not injured badly, snap some pictures at the accident scene. Take photos of the intersection, traffic lights, vehicle damage, and any other surroundings that may help your case. Collect Evidence – Gather eyewitness information, including their names and phone numbers. Be sure to write down the make, model, and year of the other cars involved in the accident. Collect the other driver’s insurance card data and identifying information. Call Rainwater, Holt & Sexton – Your next step should be to call Rainwater, Holt & Sexton as soon as possible. You need an experienced law firm on your side after a tragic motorcycle accident and we can help. Left Turn – When other vehicles fail to recognize an oncoming motorcyclist, they can inadvertently make a left turn directly into the biker. This can cause serious and fatal injuries. Changing Lanes – Busy and inattentive drivers often fail to check their blind spots before changing lanes. This can be disastrous for motorcyclists and can push bikers into other traffic or off of the road. Rear End – Rear end accidents can be devastating for bikers who lack the protection to absorb such hits. Without a bumper on their motorcycles, even rear-end accidents can cause significant injury. Dooring – These accidents occur when the driver or passenger of a parked car, opens their door into the path of an oncoming motorcyclist. Speeding – Speeding is one of the main causes of motorcycle accidents, both single vehicle accidents, as well as multi-vehicle crashes. Defects – Manufacturers of motorcycles, motorcycle parts, and tires have a responsibility to issue safety recalls when their product is dangerous or defective. Failure to do so can lead to serious and catastrophic motorcycle accidents. Poor Weather – Snow, sleet, rain, and ice can increase the risk of getting into a motorcycle accident. Motorcyclists should avoid riding in inclement weather whenever possible. Poor Road Design – Poor shoulder design, inadequate turns, potholes, and defective traffic signals can all result in serious motorcycle accidents. In some cases, the city, county, or state entity responsible for designing and maintaining that road may be liable for the accident. At Rainwater, Holt & Sexton, we have helped injured motorcycle accident victims and their families throughout the state of Arkansas for years. Our track record is one of the reasons why so many Arkansas accident victims continue to recommend us to their friends and families after a devastating accident. In Arkansas, motorcycle accident victims are allowed to seek compensation for a variety of damages – both economic and non-economic. Examples of economic damages include medical expenses, rehabilitation, long-term care, loss of future earnings, lost wages, and bike damage. Examples of non-economic damages include pain and suffering, PTSD, and loss of companionship. Brain injuries can be life-threatening and even fatal. Motorcycle accident victims who sustain a TBI may need assistance performing basic daily care and may be unable to work and provide for their families. These injuries can result in permanent brain damage and disability. Accident victims who sustain a spinal cord injury could suffer from partial or complete paralysis. They may live with nerve damage, pain, numbness in their extremities and permanent disability for the rest of their lives. These injuries are costly. Severe and deep abrasions can damage skin tissue, resulting in long-term disfigurement. Victims are often required to undergo multiple painful surgeries and skin grafts on the road to recovery. There are some injuries that will never permanently heal. Horrific fractures, abrasions, road rash, and lacerations can all result in permanent disfigurement. Accident victims will need money to help pay for medical expenses, reconstructive surgeries, prosthetics, and therapies. Motorcyclists are at an increased risk for sustaining severe trauma to their extremities in an accident, resulting in an amputation. Prosthetics are often costly and accident victims may need years of therapy to regain their mobility and learn to live their lives after an amputation. Motorcyclists can sustain serious fractures that could result in long-term disability, pain and suffering. Serious fractures may require numerous surgeries to correct, extensive hospitalizations, and months of therapy in order to heal. Motorcycle accident victims are at an increased risk for suffering psychological damage after an accident. Examples include PTSD, anxiety, depression, and insomnia. The forces of a motorcycle accident can be extreme and result in serious internal bleeding and organ damage. These injuries can be life-threatening and can result in permanent damage to the delicate organs and tissues in the body. Liver damage, punctured lungs, ruptured spleens, and kidney damage are all common after a serious accident. How long do I have to file a claim in Arkansas? If you have been injured in a motorcycle accident in Arkansas, you must act quickly. Accident victims have three years from the date of the accident to file a claim. Do I have to wear a helmet? In Arkansas, riders over the age of 21 are not legally required to wear a helmet when riding. Safety experts urge everyone, however, to consider wearing a helmet when riding. Wearing a DOT-approved helmet is the best way to reduce the risk of sustaining deadly head injuries. What if I am hit by an uninsured driver? If you have purchased UM/UIM insurance, you may be able to file a claim with your insurance company. Your attorney can help you determine how to obtain the maximum compensation after a crash. The insurance company said I was to blame for the accident, can I still collect? Arkansas uses a modified comparative fault rule in cases of personal injury. This means that even if you are partly to blame for the accident, you can still collect compensation. However, if you are found to be 50% or more at fault, then you are not eligible to collect any compensation. What if I am uninjured? Do I still need to call 911 – Yes! Even if you believe that you are uninjured, you still need to file a police report after an accident and you should be examined by a medical professional. Failure to do so could jeopardize your ability to file a claim and afterwards, it will just be your word against theirs.